The other day in the mail, I received two pieces of maiL. One piece promoted the Republican slated at-large candidates. 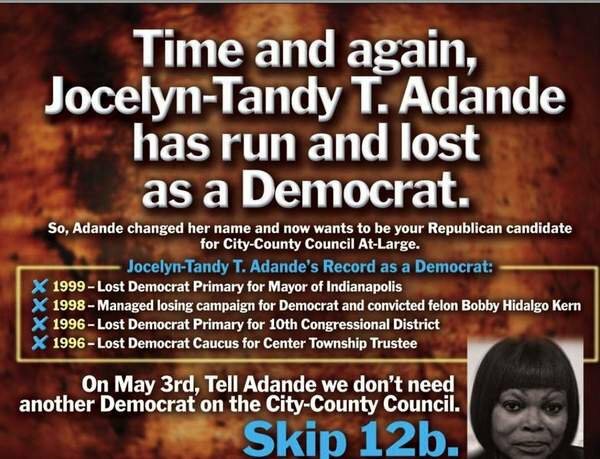 The second piece was an atack on unslated candidate Jocelyn-Tandy T. Adande talking about her having been a Democratic candidate in the 1990s. 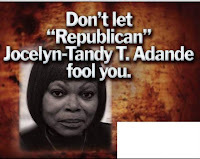 Included in the ad is a sinister photo of Adande, an African-American. The inclusion of this reminds me of the time David Brooks altered the photograph of Julia Carson in a mailing. I realize that Marion County GOP Chairman Kyle Walker doesn't like candidates he and a few insiders haven't hand-picked running for office, but last time I checked, Adande has the right to enter the primary and run for office. As far as being a former Democrat, wasn't Ronald Reagan a former Democrat too? 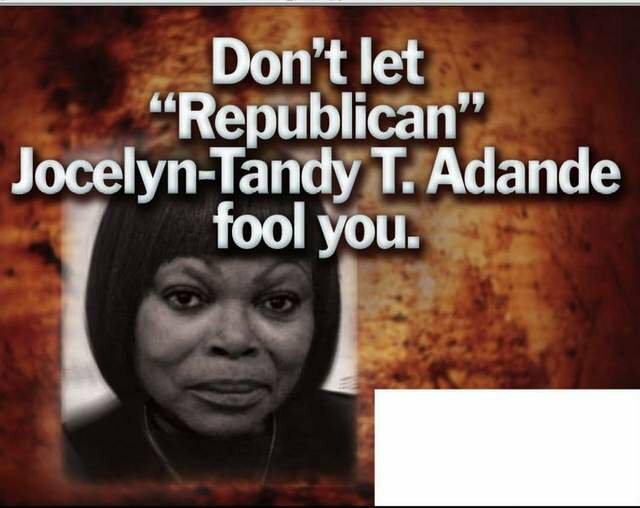 The slam piece on Adande, who is head of an African-American Republican group, was completely unnecessary. Sending the piece out wasn't about a political strategy. It was about putting a challenger in her place for having the temerity to tell party bosses that she too wanted to run for office. The attack on her is the kind of insider, closed door mentality that has virtually killed off the grass roots Marion County Republican organization. You're right. The inclusion of the photo is meant to inflame racial prejudices, to get people to respond on a visceral level. 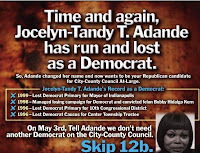 Adande's record as a Democrat is sufficient to carry the argument. Would the photo have been included if Tandy were a buxom hot blonde? This should be sent to the SPLC, and Walker should apologize or resign. Whenever Pat Andrews is the topic of a blog post, there is an anonymous blog poster that is doing the same thing. The major parties are not about ideas, they are about ambition and power. So, naturally the leaders object to any threat to their hegemony. Many an elected official has lost an election, even Abraham Lincoln. So what?